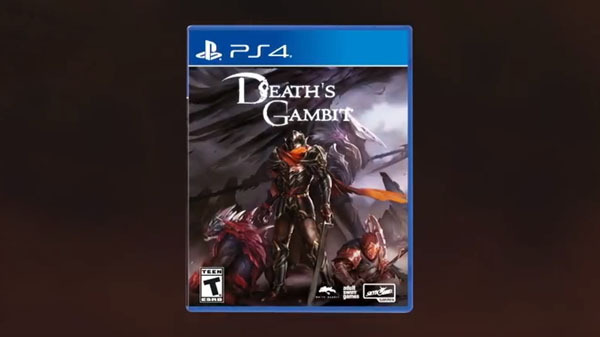 The PlayStation 4 version of Death’s Gambit will be released as a physical edition at retailers in late 2018 / early 2019, publishers Skybound Games and Adult Swim and developer White Rabbit announced. The game recently launched for PlayStation 4 via the PlayStation Store and PC via Steam. Expansive World – Travel across the beautifully rendered Obsidian Vale, Witch Woods, Sanguine City, and more. Meet quirky characters from all walks of life, and uncover their narrative threads and secrets. Character Classes – Choose from seven playable classes, level up, pick your favorite talents from the skill tree, adapt your strategies, and improve your chances of survival. Incredible Bosses – Hunt towering monsters and other creatures of legend. Each boss is a test of skill, requiring unique strategies to defeat. Non-Linear Exploration – Explore levels and bosses in a non-linear order, discover side areas with more secrets to unravel and enemies to purge. Character Customization – Outfit your character with over 10 weapon types including bows, scythes, longswords, halberds and more. Harness 30 weapon abilities and spells to create your own build. Heroic Mode – Defeated bosses experience a second wind in an exponentially harder heroic mode accessible immediately after defeating them. Give yourself an all new challenge and master their new abilities. Evocative Score – Experience an intricately crafted score composed by Kyle Hnedak, that sets the tone for Death’s Gambit‘s world with over 2 hours of evocative music. New Game Plus – Complete Death’s Gambit to unlock New Game+ in brackets of three to set your own difficulty, and endure the struggle all over again. Update 08/21/18 at 6:30 p.m.: This story initially stated that Death’s Gambit is coming to Xbox One and Switch alongside the physical release, as reported by Variety. This is incorrect and Variety has since updated its story. Watch a trailer for the PlayStation 4 physical edition below.